Warner Parks & Rec wants you to be active! It’s simple, most of us don’t get enough exercise. With the help of Warner Parks and Rec, you can now show up for a variety of fun, active and no pressure games that every adult 18 and over can have fun participating in. Old School P.E. meet ups are generally held at the gym at Simonds Elementary School. Each participant is required to sign a waiver the first time they participate in an Old School P.E. The game of the evening could be volleyball, basketball or various other fun sports and usually begins at 6:15 each Monday and wraps up at 8:00. Feel free to come by any time during that timeframe as we try to keep the format loose to accommodate different schedules. Old School P.E. is COED, social, active, fun and absolutely FREE so come join us! 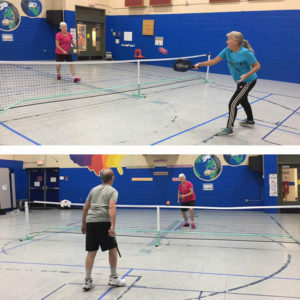 Information: Pickle Ball every Friday night at Simond’s Elementary school from 6:30-9:00. Come down and try it out! For anyone 18 years and older! We have extra paddles for new folks to borrow! Dates: 1/4, 1/11, 1/18, 1/25, 2/1, 2/8, 2/15, 2/22, 3/8, 3/15, 3/22, 3/29, 4/5, 4/12, 4/19.